We're excited you've chosen Surf Station Surf School for your surf or stand-up paddleboard lesson. We have the best instructors in the area and are able to offer lessons in three locations: St. Augustine, Crescent Beach, & The Hammock Beach Resort. Use the below form to make your reservation and make payment. Following submission, our Surf Station team will be in touch to go over specifics and confirm all your information. If you have any questions regarding lessons or would like to schedule something in a different day/time slot then what is available below, do not hesitate to contact us at 904-471-9463 or via email at support@surf-station.com. SUP lessons and rentals are available. Please call or text 904.540.1732 for information. Select the location where you would like your lesson to take place. Same day online reservations are not available. If you are looking to schedule a lesson for today, please call to check availability, 904-471-9463. Lessons are available at 9:00, 12:00, and 3:00. If you are interested in a different time slot, please contact us at 904-471-9463 to check availability. Select how many people will be participating. If you require something custom, please call or text 904-540-1732. When you click the submit button your credit card will be immediately charged the total amount shown above. You will receive a confirmation email with the lesson information for your reference. 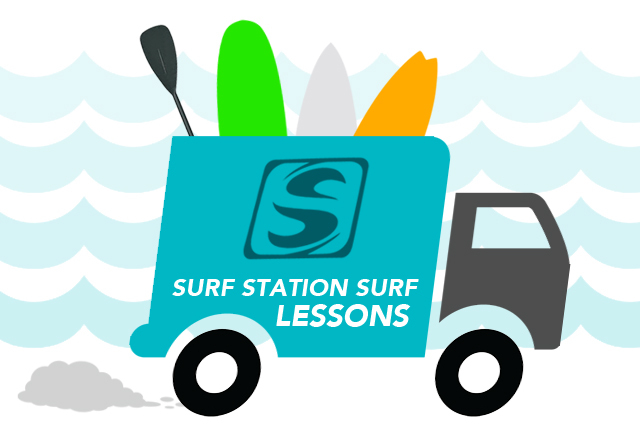 A team member from Surf Station will be in contact with you prior to your lesson to discuss details. Plan to meet us 20 minutes before your scheduled lesson to organize boards & complete waiver releases.